We collect lots of stuff in our hobby. An earlier modeling focus pushes my efforts to install correct era freight car trucks on the models. In many cases, a new set needs to be installed and the old pair ends up in a box of accumulated trucks. Occasionally, I’ll trade a few pair with a friend for earlier styles he has accumulated. These spare trucks are very handy in supporting a model to minimize damaging the details. After installing the brake system on a car underframe, you can’t just lay it down on the work bench easily. A current tank car build has delicate details on both sides of the underframe, so a pair of shop trucks comes in very handy for the model to rest upon. Keep some screws with the extra trucks so quick installs are easy. This tank car frame has K brake components that hang below the center sill. Delicate resin parts have also been installed on the top surface that will support the tank. A pair of shop trucks has been screwed into place and support the model for additional work. Wheel sets are not needed in shop trucks as the model does not need to roll. I keep several sets of shop trucks at the paint booth, too. I usually paint the underframe first. Once the paint is dry, the shop trucks are installed and the rest of the model surfaces are painted. I’m sure you have a few pair of extra freight car trucks sitting around. 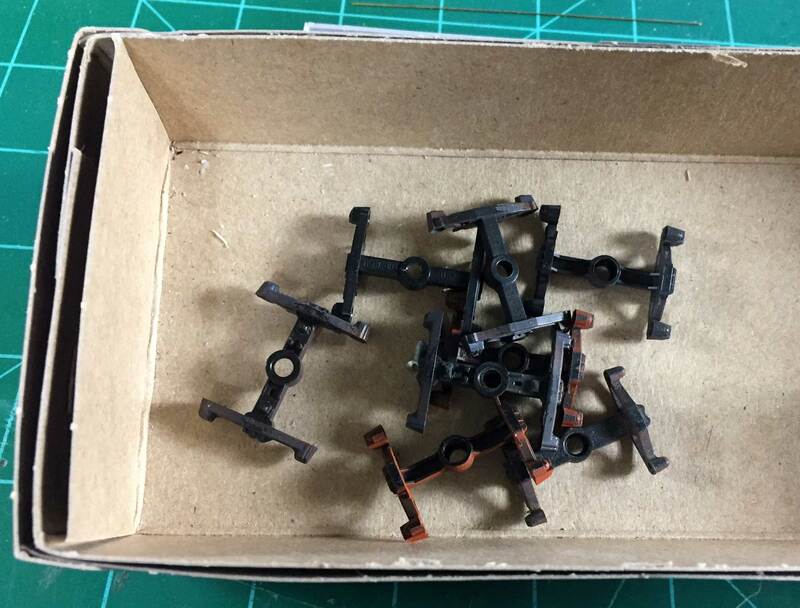 Take out the wheel sets and put them to work when you build your next freight car kit.